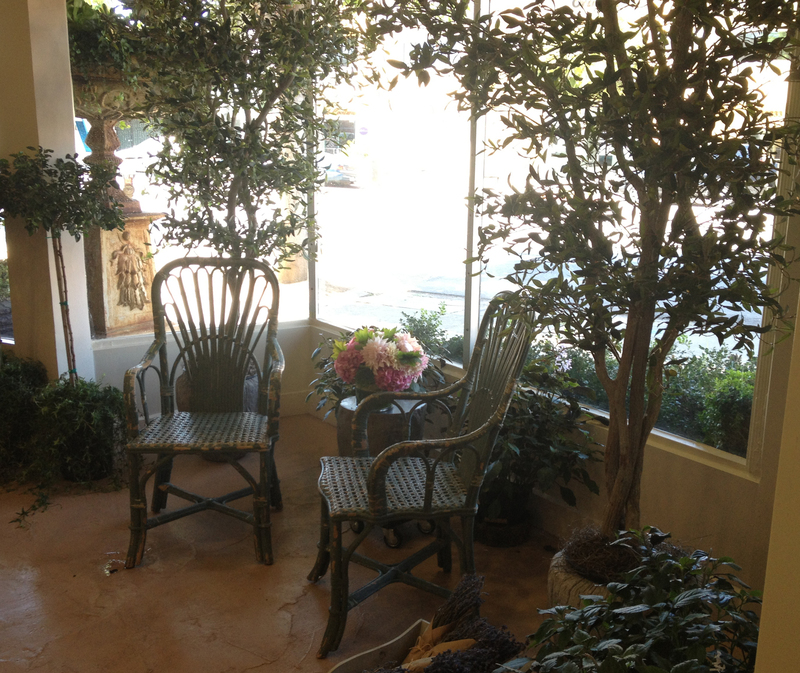 We have moved into our beautiful newly remodeled store. Come visit us and see the new things we are adding everyday. We got burned but we rose quickly from the ashes. This is us yesterday morning after the fire, up and running, almost as usual in the parking lot. Our crew was so great, they didn’t miss a beat. Luis was there all night. Marco showed up at 2AM. 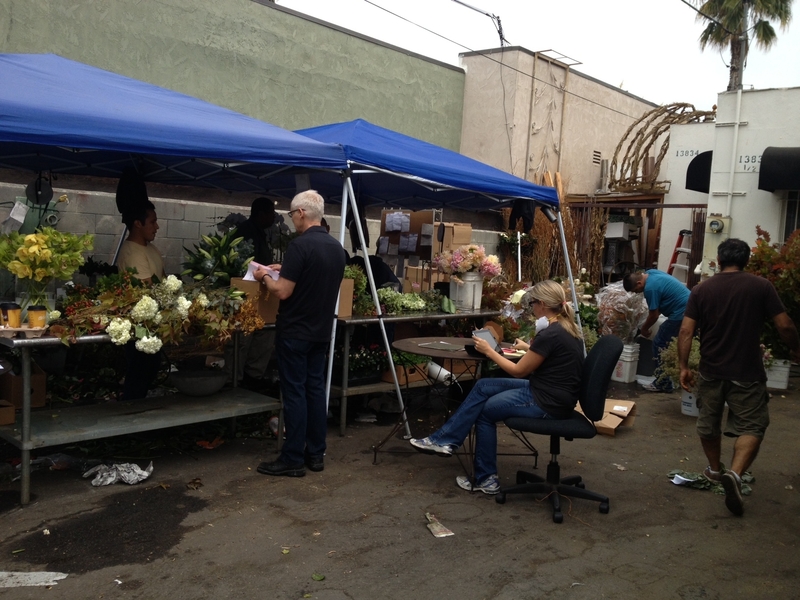 Mark went to the flowers market as usual. The crew set up camp at 6AM and things started rolling. Things never looked more beautiful! We are so fortunate. 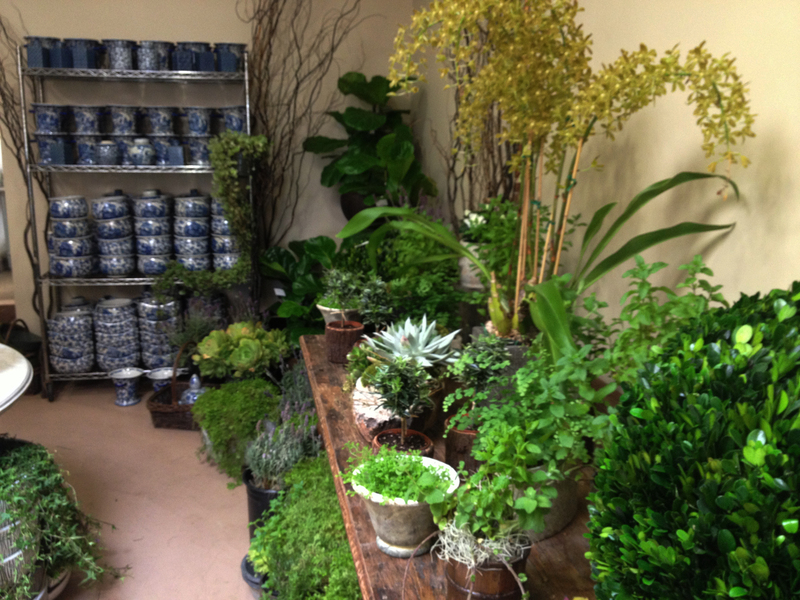 We will relocate temporarily at our spaces next door to Mark’s Garden while rennovation takes place. Thank you everybody! Read Mark’s new blog on Huffington Post. Mothers. Can you ever please them? Let’s face it. Some mothers just don’t want their kid to spend a dime on them. Buying her flowers for Mother’s Day could be the biggest sin you can commit. Well, one of them anyway. Although most mothers are loving, giving humans, a few of them are among the biggest complainers ever when it comes to flowers. One day when she was ordering flowers, I asked one of our clients, “What does your mother like?” “She likes to complain!” was the answer that spilled out of her mouth. Quickly followed by, “Uh oh, don’t repeat that to anyone!” But it’s true. Some mothers are so touched that their child sends them flowers for Mother’s Day that they demand the flowers last at least a month, if not forever. Otherwise, refund their poor, dear son’s money immediately! 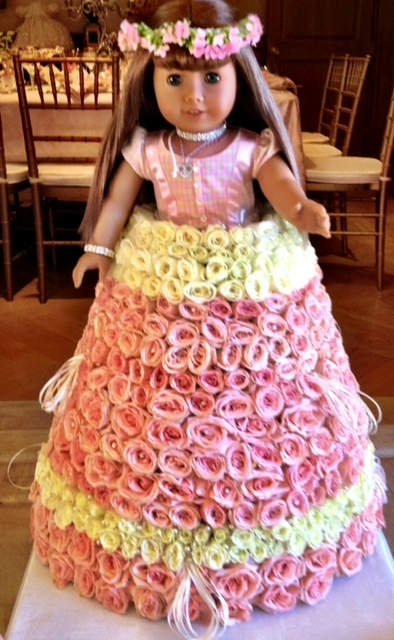 Others know that their little girl would not want to send her something that looks like this! Refund their darling daughters’ money immediately! A few simply refuse the flowers when the delivery is attempted. Thankfully, most mothers adore it when they receive flowers from their kids or anyone. The more money spent on them, the better. We never argue with that. 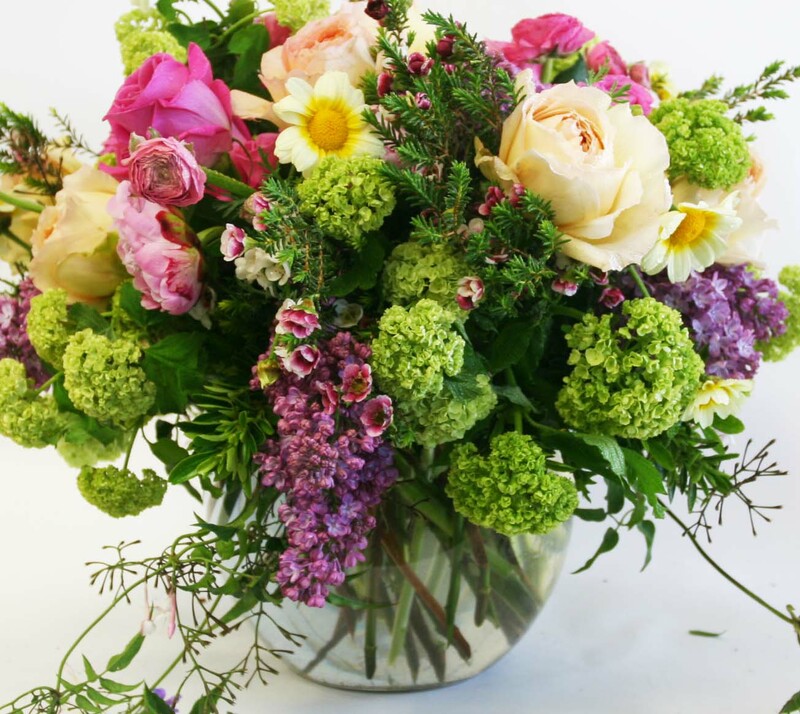 What should you send your mother on Mother’s Day? Well, first of all, if you know her favorite flower or color, send that. Pitifully few sons and daughters have any idea of either of these. 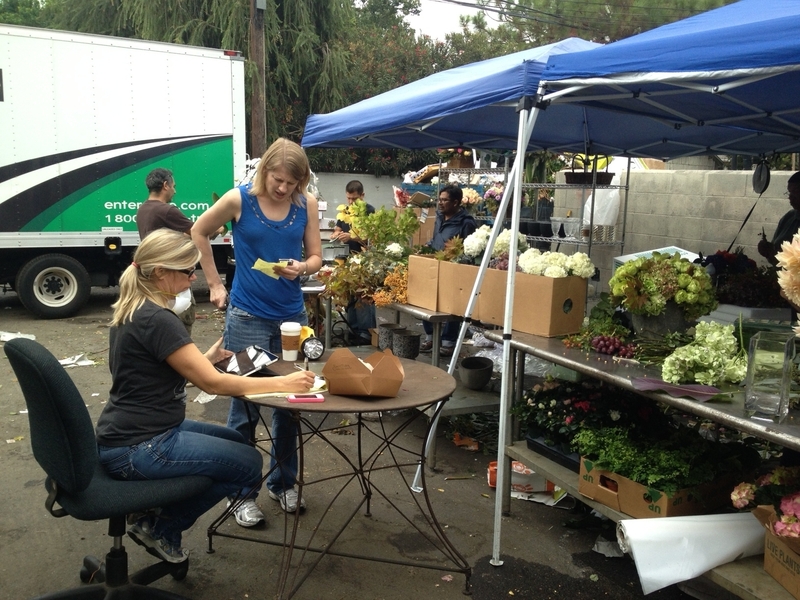 So just ask the florist what’s pretty right now. 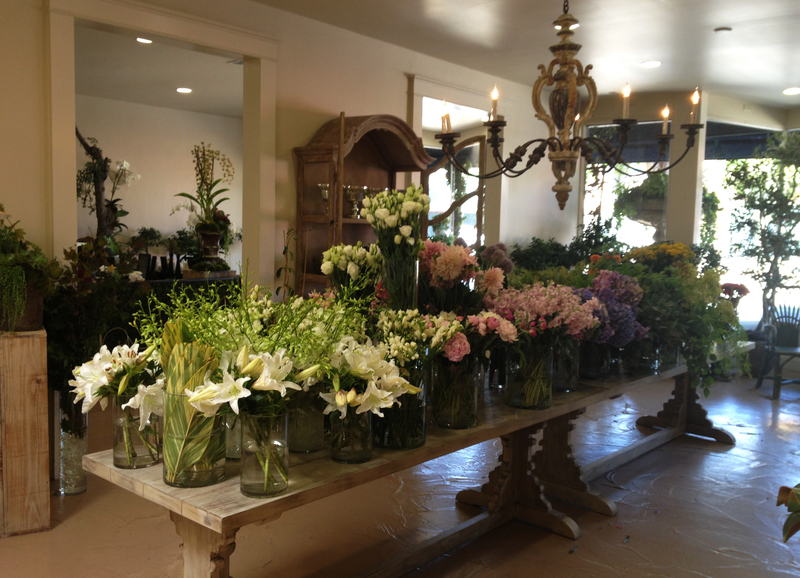 Luckily, Mother’s Day falls right in the middle of the best flower season ever. 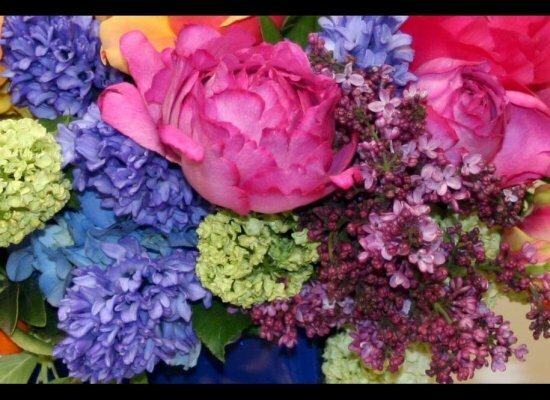 There are often peonies and lilac both available. The overlap of those two crops is usually a very short period of days. 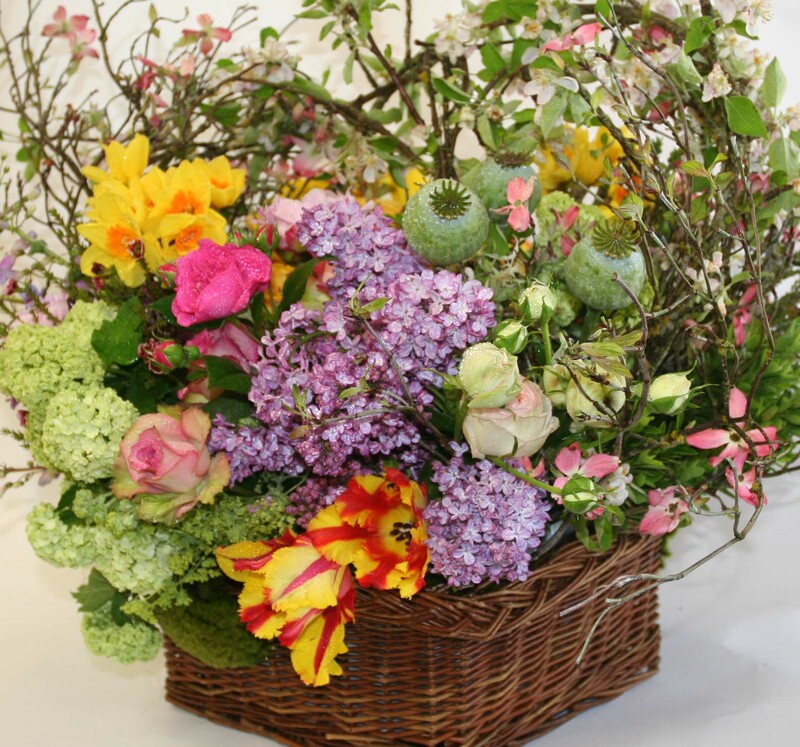 Tulips are gorgeous now in many colors as are hydrangea in various shades and viburnum in deep, rich lime green that enhances almost any spring arrangement. 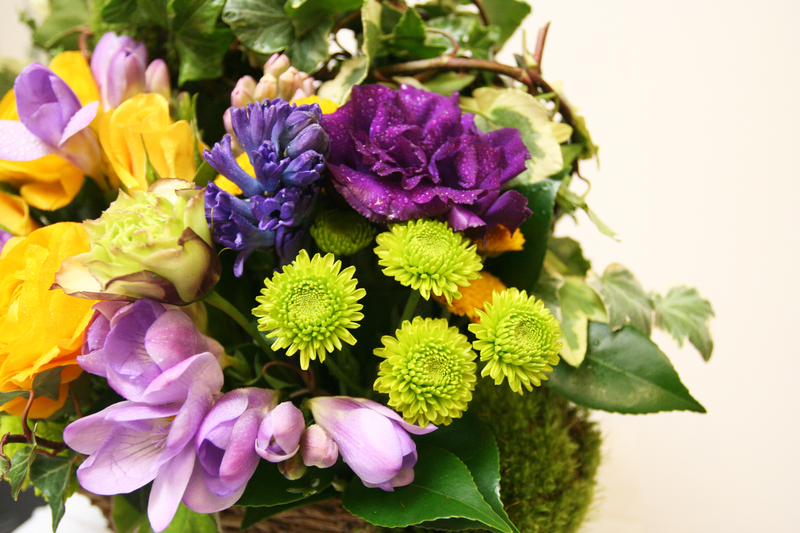 There is also a wide range of roses, hyacinth, ranunculus and, of course orchids for a more exotic look. 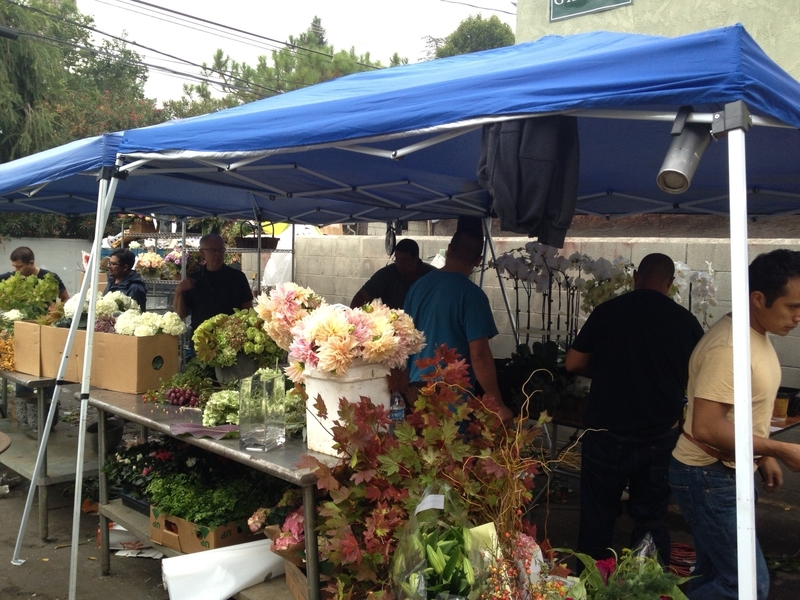 The downside of all of this abundance is that growers and suppliers know that everyone wants flowers the week preceding Mother’s Day. After holding them back from the florists for weeks ahead, everything is suddenly “available” but the prices are higher than ever. You may think the prices are outrageous and we have to agree somewhat. But there is little we can do to change things other than boycott Mother’s Day. And then, all of those sweet little mothers who never complain will have their hearts broken and think their children do not love them. What’s a kid to do? Send the best thing you can and let Mom know you love her. Even if it’s just a single rose, or better yet, a single peony. Remember Mother’s Day. It only comes around once a year. Administrative Professionals Week is here. It is always the last full week of April so observation officially starts Monday the 23rd with Wednesday. April the 25th the designated day. That means, if you want to be a really good boss, you will have flowers on your assistant’s desk on Monday. If you don’t want to see a frowny face, you will definitely want to have them there by end of the day Wednesday. This may mean you have to pick them up yourself and take them in because if you have not ordered them by now your florist is possibly too busy to get them there by the end of the day. Fortunately for those really tardy bosses you still have Thursday and Friday to make it up to your assistant. Hopefully these flowers will be bigger and better than anyone else in the office has received earlier in the week. Happy Administrative Professionals Week! OK everybody, stop and drop everything. It’s Oscar season! During this time of the year here in Los Angeles, everything stops for the Oscars. At least for some of us. Greece? Spain? Italy? You must be talking about a foreign film nomination, not the economic crises. Los Angeles is a film industry city. Now, the Oscars are a lot of different things to a lot of different people. For us, it’s all about the flowers. We are doing floral decor again this year for the Governors Ball, the gala that follows the Oscars telecast at the (maybe) Kodak Theatre. Things are switched up a bit for this year’s Ball. No longer the 130 tables for a seated dinner. Rather, going with the style of the moment, this year’s Ball will be club lounge style. Intimate seating groups, coffee tables and banquettes. And low lighting. (Although just bright enough to see the stars across the room and to see the steps in front of us so we don’t break our necks rushing to move into their sphere.) The color palette is monochrome — white, silver, taupe. Then we get to punch it up with the flowers, which are all red. 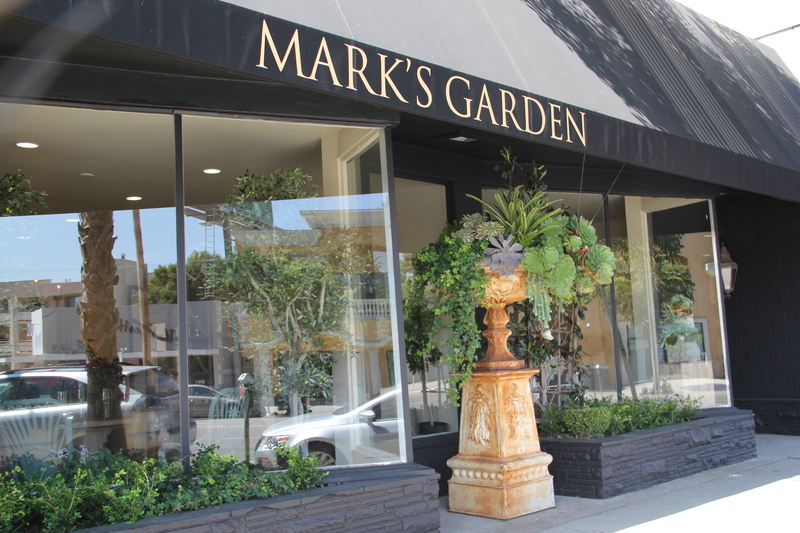 So for Mark’s Garden, we’re seeing RED this year for the Oscars. I am always surprised how few red flowers there really are. A lot of yellow, lots of pink and white, but not so many different types of flowers in blue or red hues as one would think. Red roses, there are plenty of those in many varieties and shades. Red tulips are not an option for an event like this. Their color is always a little off. They don’t hold up well enough to use for a large-scale installation. And tulips have a mind of their own — they grow, they twist, they bend. They don’t necessarily do what YOU want. Of course, there are carnations, which come in many beautiful shades of red. But can you imagine the gasps of disgust when the coolest people in the world walk into the Governors Ballroom and see the space filled with carnations? I wouldn’t be able to show my face in this town again. We are not quite ready for the reemergence of this really beautiful, and once most popular, flower, I am afraid. But the time will come, I promise. Red calla lilies are great to use because they are so sturdy and everyone loves them at the moment. Gloriosa lilies from Holland will look great. Some varieties of red orchids, too. And great red dogwood branches from Oregon along with red ti leaves from Costa Rica. I don’t care for the shade of red of anemones, ranunculus or sweet peas. Plus no one can not get enough quantity of these flowers, anyway. 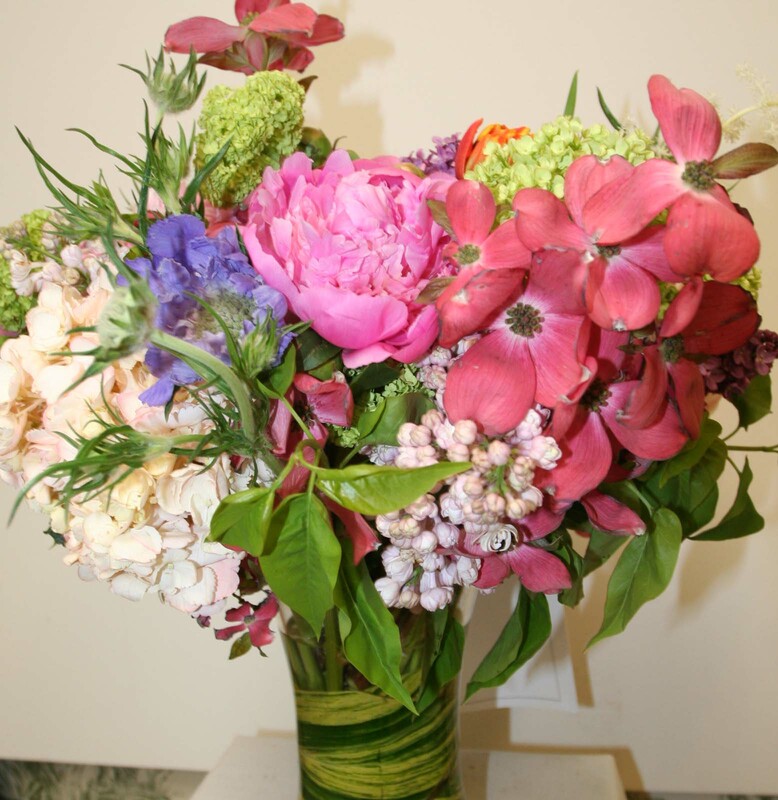 For big events, you need to be able to get large quantities — thousands — of sturdy flowers; flowers you can use to design a large space, different from what you would use to design a centerpiece for a dinner party. For your Oscar party at home, you can use any kind of flowers as long as they are red. And put them in a black container. If you don’t have black containers, spray paint whatever you have. 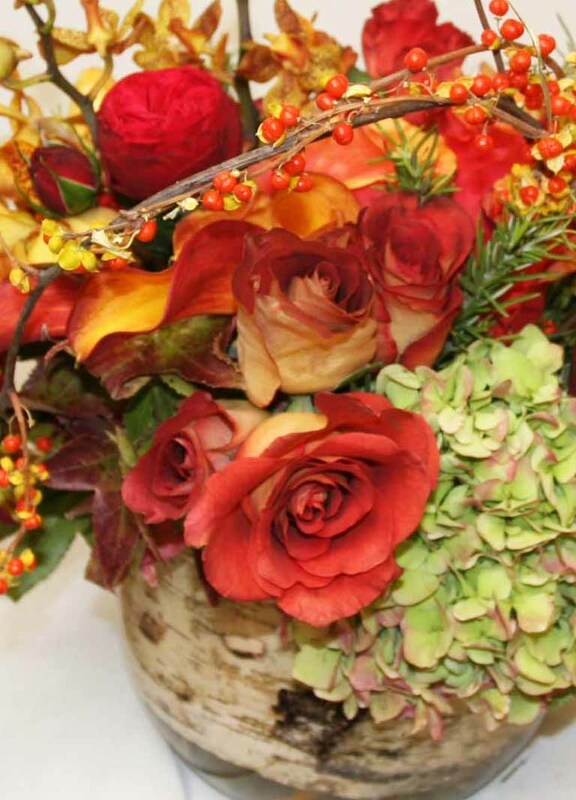 Put a few blooms of red ‘whatever’ in some small black boxes or bowls and set them out on your coffee table or buffet. Voila! You are set to sit back and enjoy the Academy Awards, perhaps munching on popcorn and without having to slip into that fancy gown or tux. And you don’t even need to run out and borrow some diamonds or emeralds. A few people showing up at the Oscars might envy you that night. Remember, there are some people who don’t really want to go to the Academy Awards… Hmmm… Although, I can’t really think of any at this moment. 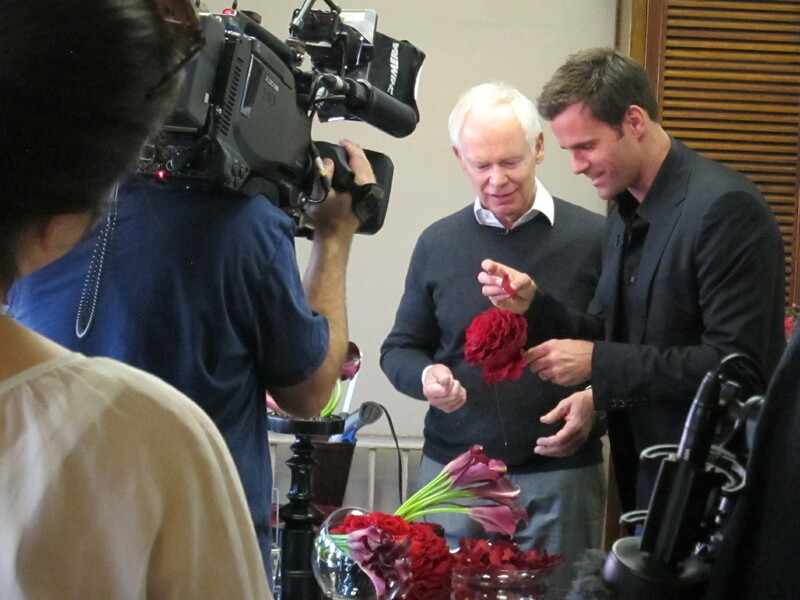 Mark teaches Cameron the art of making a hand made bloom.